A friend of Caitrin's from ballet turned thirteen a couple of weeks ago and we just had to make her a gift. Thirteen is a very special birthday and this is a special young lady. 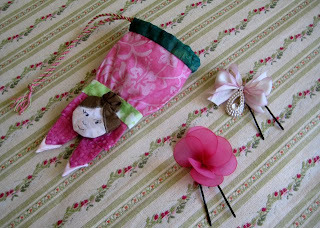 We made this little ballerina doll bag with a fabric yo-yo for a bun - we thought it was perfect because Caitrin's friend collects dolls. It was inspired by the Boy Acrobat project in Omiyage, by Kumido Sudo. As you can see, we made some hairpins for her to use as well, but they don't fit inside the bag. Oh dear. We love them anyway. 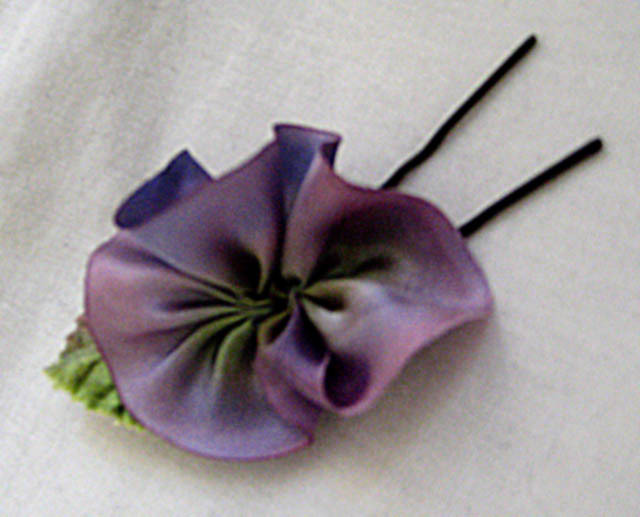 A word about silk ribbon... Yes, it is expensive and it does fray a bit at the edges, but it takes fabric dye in a manner unlike any other material. The depth and luminosity of color in hand-dyed silk ribbon is incredible and just a small piece can make a project sing. The ribbons I used for these hairpins were from a trip to M & J Trimming in New York City a couple of years ago. They have an extensive online store - check them out! 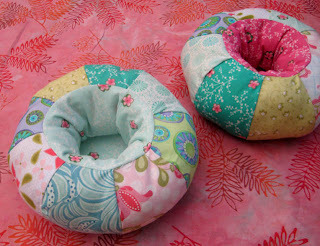 And, since I just cannot stand to waste fabric, we used the last few scraps we had leftover from our Fabrilicious Eggs, Flower Coasters, and Yo-Yo-Pillow to make these pincushions.